The Days of Johann, an agility dog! : Turtle! The other day we were out hiking after a big rain, and what to my wandering eyes should appear? A turtle. Ok, I've never seen a turtle in my life. I admit it, I've been sheltered. We were walking along the makeshift road near the ponds, when suddenly I jumped about a foot high. That's kind of high for a little guy like me - 12 full inches to be exact, four more inches and I'd have been jumping an agility jump. Mum didn't see the turtle before I did, and good thing I jumped because Mum thinks it was a snapping turtle. So she had me come closer to her, while we both inspected he/she at a distance. The nice thing is it gave Mum a little chance to work on reactivity with the Grace-ster. 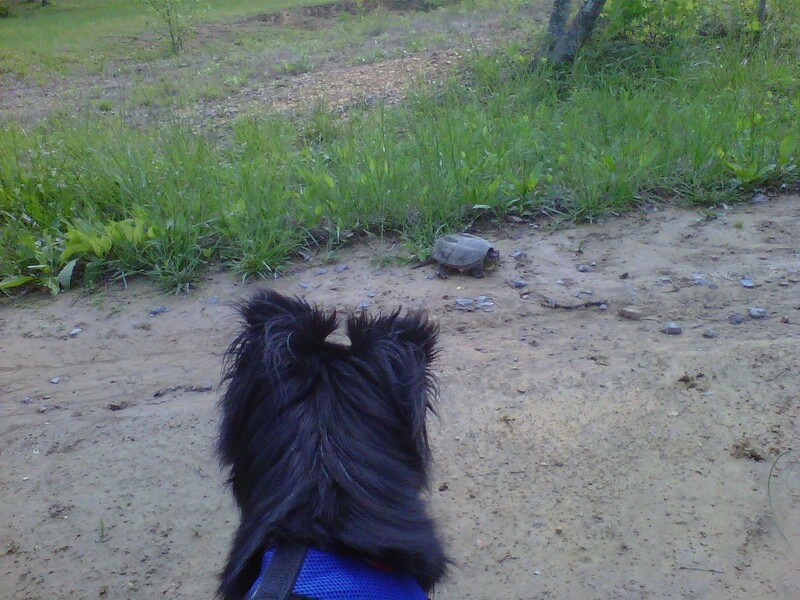 Notice how Mum gives her good girls every time she turns away from the turtle and comes toward her. My current labrador Rusty hardly pays any mind to turtles. Columbo (who died many years ago) was quit different. The box turtles he would carry gently in his mouth when he found them on our walks. He was always curious even with the snappers which I would have to keep him from. It's a good thing you two didn't get too close - he could snap your nose right off and I'm not kidding! We were a little scared for you...but are glad everyone got out alive!